Wasn’t that a ski season to remember?! This year the club was blessed with consistently good snow conditions from late December right through until the end of March! 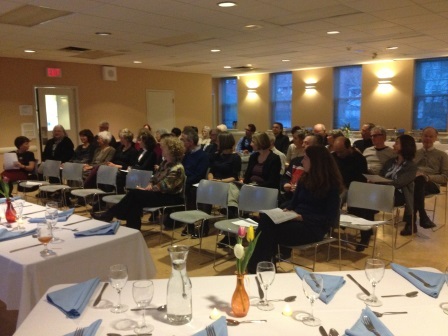 On behalf of the board of directors, both past and present, I wanted to thank everyone who came out for the club’s Annual General Meeting and year-end dinner on March 28. We had a great turn-out and Xavier provided a wonderful summary of the club’s activities over the last year. I also wanted to give a special shout out to Bruce Smith for being our master of ceremonies once again this year! Minutes from the AGM and annual financial statement will be posted in the member-only area of the Trakkers web site in June, after the club’s year-end in May. Great turnout for the AGM! 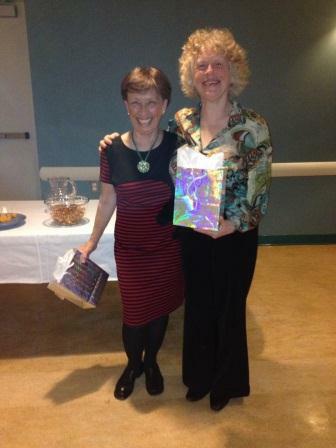 Hanna and Sylvia with their 20-year awards! 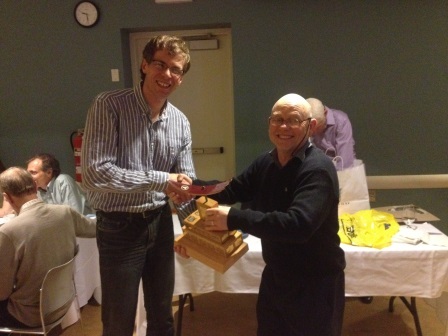 The Broken Ski Trophy went to outgoing President, Xavier Lambert. In fact, the Broken Ski always goes to the Club President, as a special thank you and to recognize that the President contributes to just about every facet of the Club. The Ski School Award went to Hilary Linton (you can check out a photo of Hilary in her prize Trakkers toque on our Facebook page). And finally, this year the Bernie Trophy for outstanding contribution went to Gleb Jegaline, in recognition of his ongoing work on the Trakkers web site. For those who may not be familiar with this award, Bernie Lukasik was very active with Trakkers in the 1980s and 1990s. Even when he was not on the board of directors, Bernie lent a helping hand wherever needed. His input was always constructive. While Bernie was alive, he awarded the trophy annually to a member who had contributed in a similar fashion. The club now continues this tradition in his honour. Trakkers is pleased to let new and returning members know that our annual membership rate for next year will remain the same as this year – and we will be having an Early Bird rate of $70 until September 30, 2014. In addition, any members who have paper vouchers and who may wish to apply them to next year’s membership are encouraged to mail them in to the club for credit now, unless you can remember to bring them to November’s Open House. We’ll transfer the vouchers into a credit to your online account in our membership system so it’ll be applied whenever you renew your membership online. Mail your paper vouchers in to the Trakkers post box. Our Weekend Trips Coordinator, Henry Furlott, is seeking recommendations for new potential weekend trip destinations for next season. If you’ve been to a resort within reasonable driving distance from Toronto (preferably 2.5 hours — Parry Sound, Kawartha Lakes and Haliburton areas), close to some ski trails, and that you think could be an interesting destination for the club, please let Henry know (ASAP so he can check them out this summer). You can reach him at weekendtrips@trakkers.ca. Planning is in the works for several off-season events and get-togethers over the summer months, including the club’s 3rd annual “Spokes and Spigots” biking and winery day tour in Niagara region on Saturday, July 12. See the tour flyer for more information and registration details. Details on more activities will be announced in the May President’s Broadcast – and keep an eye on our web site! If any club member is interested in coordinating an event, or has some ideas, please contact Simon Monk, our Social Coordinator, at social@trakkers.ca. Interested in Helping Us Recruit New Members? The club is always on the look-out for opportunities to promote the benefits of cross-country skiing and to attract new members. Are you in another fitness-related club and think there could be an opportunity for cross-promotion? The board is interested in hearing your ideas of how we could be reaching out. Send your suggestions to Alda Zeila, our Publicity Coordinator, at publicity@trakkers.ca. The club executive was deeply saddened to learn of Paul Zamodits’ passing last week. Paul was an active member in the club up until a few years’ ago and he will be missed. Messages of condolence may be left on the funeral home web site. This entry was posted in President's Blogs on April 27, 2014 by trakkers.